Get in front of electronic payments with the experts behind NACHA. NACHA has been serving the industry as a trusted leader in electronic payments for decades. With the launch of Elevation consulting, we are able to expand our advisory capabilities and work with companies to help them achieve success. Empower innovation. Improve cash flow. Enhance data quality. Manage risk. Leverage global standards. Amplify efficiencies. Reduce costs. 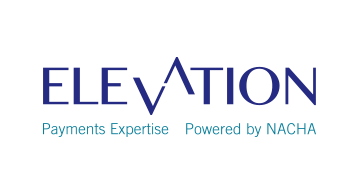 Elevation is your trusted partner for smart payments.